Although historians have devoted a great deal of attention to the development of federal government policy regarding civil rights in the quarter century following World War II, little attention has been paid to the equally important developments at the state level. Few states underwent a more dramatic transformation with regard to civil rights than Michigan did. In 1948, the Michigan Committee on … Civil Rights characterized the state of civil rights in Michigan as presenting "e;an ugly picture. "e; Twenty years later, Michigan was a leader among the states in civil rights legislation. 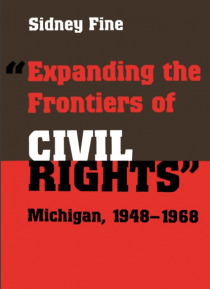 "e;Expanding the Frontiers of Civil Rights"e; documents this important shift in state level policy and makes clear that civil rights in Michigan embraced not only blacks but women, the elderly, native Americans, migrant workers, and the physically handicapped.